Sepsis is a serious and sometimes life-threatening condition, in which the body is fighting a severe infection that has spread throughout the bloodstream. Every year, severe sepsis strikes an estimated 750,000 people in the United States. Mortality can be as high as 50 percent in the case of septic shock, the most severe form of sepsis. Early recognition of sepsis and timely initiation of appropriate therapy is key for survival from this potentially devastating condition. Our Chemistry Analyzer measures Procalcitonin (PCT) levels and represents an extremely valuable tool especially in intensive care units, where sepsis is a major public health concern. The test to detect Procalcitonin takes just 20 minutes, making it possible to obtain early indications so the patient can be given proper treatment. PCT thus contributes to improved patient care and increases the patient’s chance of survival. 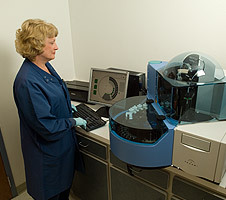 The same technology is also used for monitoring antibiotic therapy and the patient’s response to treatment.